Miller argues that there are distinct benefits for families who reject the false choice of “either/or” and instead embrace the synergy of being both. Reporting on hundreds of parents and children who celebrate two religions, she documents why couples make this choice, and how children appreciate dual-faith education. But often families who choose both have trouble finding supportive clergy and community. 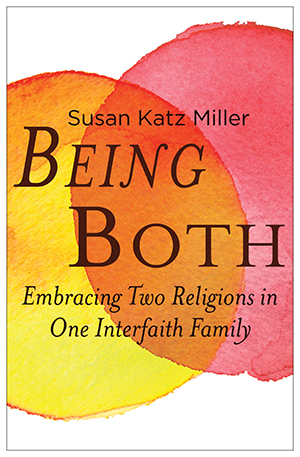 To that end, Miller includes advice and resources for interfaith families planning baby-welcoming and coming-of-age ceremonies, and seeking to find or form interfaith education programs. She also addresses the difficulties that interfaith families can encounter, wrestling with spiritual questions (“Will our children believe in God?“) and challenges (“How do we talk about Jesus?“). And finally, looking beyond Judaism and Christianity, Being Both provides the first glimpse of the next interfaith wave: intermarried Muslim, Hindu and Buddhist couples raising children in two religions. "Beginning with the story of her family of origin, Miller surveys the burgeoning phenomenon of families who observe two religious faiths. Her Jewish father married an Episcopalian who, though agreeing to raise the children as Jews, still informally baptized little Susan in the kitchen sink (her mother and sister each did the same, though it was years before they dared tell even one another). So began a multigenerational interfaith reality, which Susan continued as another Jew married to a Christian, this time in a ceremony that honored both religions. Four years later, the couple joined the Interfaith Families Project (IFFP) of Washington, D.C., whose mission is to raise member families' children as Jewish and Christian. From the members, clergy, and teachers of IFFP and similar organizations elsewhere, Miller gathered the stories of how these families successfully raised children who are happily interfaith and intend to raise interfaith children themselves. Miller concludes this fine resource with a look at the next wave of, this time, Christian-Muslim and Christian-Hindu interfaith families." "An insightful examination of one way that religious beliefs are shaping American families." EACH YEAR, MY EXTENDED clan gathers for a huge Passover seder in Florida. My eighty-eight-year-old father presides over the ritual meal, leading us through the prayers and songs of religious freedom. The family at the table includes believers, seekers, and secularists, Jews, Catholics, Protestants, Buddhists, and those who claim interfaith identity. A Jewish nephew who is about to become a bar mitzvah and a Catholic nephew who just received First Communion compete with my interfaith son to find the traditional hidden matzoh. We are a joyous, motley crew, intent on celebrating together. In twenty-first-century America, we live in a kaleidoscope of religious identities: complex, swirling patterns of faith, spirituality, heritage, and practice. Many of us attend more than one place of worship. We change our religions more than once in a lifetime. We may believe in God or not but still seek spiritual experience inside and outside of churches, synagogues, mosques, and temples. And we are marrying across traditional lines of race, ethnicity, gender, and religion. In the midst of this religious flux and flow, interfaith couples are making a new and controversial choice: raising children with both family religions. As an interfaith child and an interfaith parent, I feel exhilarated by this new fluidity, empowered by the transition away from restrictive either/or identity labels and into the inevitable and more expansive both/and future. Americans are leaving behind traditional single-faith identities. Almost a quarter of us attend religious services of more than one faith or denomination, according to a 2009 study by the Pew Forum on Religion and Public Life. “The religious beliefs and practices of Americans do not fi t neatly into conventional categories,” that study concludes. At the same time, according to Pew researchers, more than one in four American adults change faith affiliation at least once, and that rises to almost half of us if it includes denomination changes (for instance, from Lutheran to Methodist). Meanwhile, the proportion of religiously unaffiliated Americans has grown rapidly--to almost 20 percent of the population. And yet, the majority of those 46 million unaffiliated adults believe in God or a universal spirit. This seeming paradox--belief in God without religious affiliation--will not come as a surprise to those in interfaith families, many of whom have rich spiritual lives but do not belong to a church or synagogue. My family would be classified as religiously unaffiliated, even though we light Shabbat candles on Fridays, sing Christian hymns in church with extended family, and wrestle with theology as we educate our children in both religions. I am not advocating for a “spiritual but not religious” rejection of community. The hunger for community, for belonging, is universal. As human beings who evolved in clans and tribes, we crave social networks. Religious community provides intergenerational bonding, the support of wise clergy, preservation of our shared history and texts, and the comfort of ritual--not to mention the arrival of casseroles in times of trouble. Growing up Jewish, I learned that no choice made by parents can eliminate completely either the challenges or the gifts of being born an interfaith child. Each pathway--choosing one religion, choosing two religions, choosing a third religion, choosing no religion--has advantages and disadvantages. Books, outreach programs, and couples groups sponsored by religious institutions push, with varying degrees of subtlety, for couples to choose a particular pathway. Here, I acknowledge my own bias as I argue for the legitimacy of the pathway that works for me, my husband, and my children: doing both. Clergy often state that children raised with two faiths will be confused. The scant evidence they cite dates from an era when there were no interfaith communities. Some of those who claimed they were raising children with both religions were actually raising them with very little religion at all, in part because society disapproves of choosing both. Extended family mourned for the intermarried couple; clergy rejected them. In short, many early attempts to raise children in two religions were doomed by lack of support. A child raised in a community of supportive interfaith families, with clergy from both traditions, has a very different experience from a child raised by parents who are isolated by their interfaith choice. My own two teenagers have been loved, challenged, and guided by a rabbi and a minister working as a team. And they have been welcomed at church and synagogue by family on both sides. This book presents preliminary evidence that children raised in interfaith family communities can become sensitive and articulate interfaith spokespeople, drawing strength from two religions. WE ARE ALL INTERMARRIED Whether Jews or Christians or Hindus or Buddhists, no two individuals have identical beliefs and practices; thus, every marriage could be considered an interfaith marriage. Many interchurch couples share some of the same challenges and benefits of intermarriage, whether the marriage is Baptist/Quaker, Lutheran/Unitarian, or whether it’s an “intershul” Jewish marriage such as Modern Orthodox/Jewish Renewal. Even if both partners are Roman Catholic, they may not share identical beliefs on the power of prayer or the role of women in the Church. Even if both partners are Reform Jews, one may be an atheist and one a Kabbalistic mystic. Most of the couples in this book are Jewish and Christian, but I believe their stories will inspire interfaith Buddhist, Hindu, Muslim, and Pagan families. I focus on Judaism and Christianity not only because of my own experience as the middle generation in a happy three-generation Jewish and Christian family but also because Jewish and Christian families constitute the first great wave of religious intermarriage in America, on the forefront of creating programs to educate children in both family religions. Interfaith marriage is the norm in many communities now, rather than the exception. The Pew Forum’s 2008 U.S. Religious Landscape Survey found that 37 percent of all Americans married or living with a partner are in interfaith (or mixed denomination) relationships. Some religious institutions feel threatened by the rise of intermarriage, queasy about the religious kaleidoscope. Many Jewish institutions and some Christian denominations, including Roman Catholicism, the Greek Orthodox Church, and Mormonism, have policies discouraging intermarriage. And yet the intermarriage rate continues to increase. A 2005 report from the U.S. Conference of Catholic Bishops found Catholics marrying out at a rate as high as 50 percent. The intermarriage rate for Jews married since 1996 was calculated to be 47 percent by the 2001 National Jewish Population Survey (NJPS). There are over a million of these Jewish/non-Jewish families in America, a number that is growing by at least forty thousand each year. What we can say is that the majority of American children with Jewish heritage now have Christian heritage as well. In other words, children are now more likely to be born into interfaith families than into families with two Jewish parents. And Jewish institutions are just beginning to grapple with this fact. Some Jewish leaders still call intermarriage the “silent Holocaust.” Others view it as an opportunity to increase the number of Jewish conversions or at least the number of Jewish children. When two Jews marry out, rather than marrying each other, the number of children with Jewish heritage doubles. “The extended’ population of Jewish ancestry in the U.S. is continually expanding as a result of mixed unions,” observed demographer Barry Kosmin in a 2009 paper based on the American Religious Identification Survey (ARIS). Many now call for greater acceptance of Jewish intermarriage in the face of this demographic reality. Rabbi Arthur Blecher goes even further in his book The New Judaism, arguing that such marriages are not only genetically healthy for Jews but have been common throughout Jewish history. He contends that the low rate of Jewish intermarriage in the first half of the twentieth century was actually an exception, and that the panic over Jewish intermarriage today is caused in part by the abrupt transition from a period when American Jews were isolated as an immigrant culture, back to a higher rate of intermarriage in recent decades. Some of us are audacious enough to believe that raising children with both religions is actually good for the Jews (and good for the Christians or for any other faith or denomination represented in the marriage). The children in these pages have grown up to be Christians who are uncommonly knowledgeable about and comfortable with Jews, or Jews who are adept at working with and understanding Christians. Or they continue to claim both religions and serve as bridges between the two. I see all of these possible outcomes as positive. LIKE IT OR NOT, COUPLES ARE CHOOSING BOTH For years, religious institutions have attempted to portray choosing both religions as completely outside the norm. And yet, 90 percent of intermarried Jewish families reported having Christmas trees, while over half of them also lit Hanukkah candles, according to an ARIS report as far back as 1990. But only in recent years have researchers begun to acknowledge the existence of dual-faith families as a significant category. Faced with the failure to conduct any national survey of the Jewish population in 2010, individual Jewish communities around the country conducted their own local studies. Most of these studies measured the percentage of children being raised as “Jewish and something else” or “partially Jewish.” In other words, they acknowledged a separate category for children being raised with two religions. And they discovered that in some areas, more interfaith children are being raised with two religions than as exclusively Jewish, according to a compilation of these studies by the North American Jewish Data Bank. Such places included Minneapolis (33 percent “partially Jewish,” versus 30 percent “Jewish only”), San Diego, and Philadelphia. And at least a quarter of all children of intermarriage were being raised with two religions in places including Chicago, Saint Paul, and Tucson. Meanwhile, the percentage of adults in “Jewish” households self-identifying as “Jewish and something else” or as “partially Jewish” in the New York area shot up from 2 percent in 2002 to 2 percent in 2011. Sociologist Steven Cohen of Hebrew Union College labels the children of Jewish intermarriage who claim more than one religion as part of what he calls the “borderland Jews,” a term with a kind of Wild West flair that appeals to my rebellious side. However, this term has the same limitation as “half-Jew” or “partial Jew”--all these labels define us by Jewish fraction while ignoring the rest of our (Christian or other) identities. The panic over Jewish continuity dominates both the research and the discourse on interfaith families. I begin with my own story of growing up Jewish in an interfaith family, and then describe why my husband and I joined the grassroots movement to form interfaith family communities. I explore the specific benefits of choosing both religions and then address the most common objections to this choice. I profile couples that have chosen this pathway, and the clergy and teachers who support them. I describe interfaith birth rituals, coming-of-age rituals, and education. At the heart of the book, the first generation of teens and young adults to graduate from interfaith education programs relate their own experiences. And finally, I explore the next wave: Muslim, Hindu and Buddhist interfaith couples. My intention is to share the joy that I have found in “being both.” I am motivated by the tremendous spiritual strength and comfort I feel when sitting with my Christian husband and my two interfaith teenagers, surrounded by over a hundred other interfaith families, singing and reflecting together in a community that provides each of us with equal rights and responsibilities. In this setting, it does not matter whose mother or father (or grandmother or grandfather) was which religion. It does not matter who had, or did not have, a bris or a baptism. There are no prohibitions on which of us can read a text, or sip the wine, or touch a ritual object. My own journey has convinced me that interfaith children, no matter what religious education they receive, no matter what religious labels they choose, embody two cultures and two religions. I argue that American religious institutions must acknowledge, rather than ignore, the reality of dual-faith identity and the children who represent the flesh and blood bridges between religions. Is it unfair to expect interfaith children to play this novel role? Is it a risky experiment to educate children in two religions, a leap into the unknown? I don’t think so. Instead, I think being both may contribute to what the mystical Jewish tradition of Kabbalah calls tikkun olam--healing the world.